Usually it's meant to be a Woolseyism, when name changes are made so the audiences of the foreign country can better understand and relate to the characters. Names are also changed to avoid controversial names (or have different meanings in another culture like Mr. Satan), prevent trademark infringement or retain Meaningful or Punny Names that would otherwise be lost in a more pure translation. In the case of video games, these have often come about due to limitations in the number of characters used in a name (Japanese names can become much longer when written in the Roman alphabet). Sometimes not all the names will be translated, leading to Aerith and Bob situations in some cases. Often, the dub name becomes so heavily ingrained in the local culture that it's difficult to imagine anyone using the original names. On the other hand, as mentioned in Subbing vs. Dubbing, there are countries where dubbing is only done for works intended for young children, who (obviously) can't read the subtitles used to translate everything else fluently. In those countries, this trope is much harder to pull off - for a viewer in, say, Israel or Finland, having subtitles that read "Israel Israeli" or "Matti Meikäläinen" respectively, while the name spoken on-screen is "John Doe", is somewhat confusing. Fans of the original material are likely to get upset about or ignore the name changes (and some are legitimate Macekres) but other fans have embraced (or at least tolerated) these name changes. It usually depends on how strong the culture/national pride in the original work comes out; European names on characters who are supposed to be Japanese and from Japan can seem a little odd. As well, some are not actually changes but a romanization or translation that is easier for foreign voice actors to replicate. In some cases, it's possible to more or less literally translate a name, eg. in most cases of Luke Nounverber or Something Person; such a name might be left untranslated, translated literally, translated partly literally, or changed altogether. Also worth noting is that it's actually common practice for foreigners to adopt European names in real life because it's easier than having to explain how to pronounce their original name again and again. 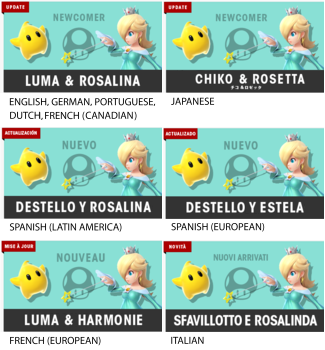 Japanese names are an exception because their naming convention is easier for European language speakers to grasp. For the same name with a different spelling see Spell My Name with an "S". See also Clean Dub Name when it happens to avoid profanity or jokes. For changes made to work titles, see Market-Based Title. Frequently occurs in a Cut-and-Paste Translation. May also cause local I Am Not Shazam situations.